We are celebrating Cheryl’s one year anniversary at Dermatology Consultants. Cheryl is the first person you will see as you walk in the office. Her bright smile will make your day better! 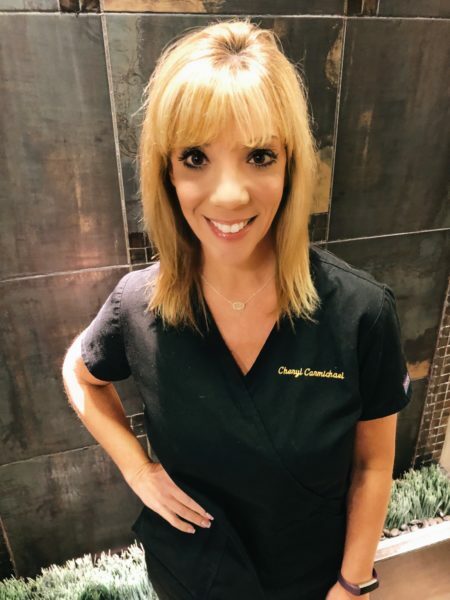 A little bit about Cheryl, she got her Medical Assistant Certificate in her early twenties and worked for the Obstetrician who delivered her! After he delivered three of her own four children she stayed home and raised the kids. Becoming a Medical Assistant was not her first job… that would be working the concession stands at the Texas State Fair. Bert’s Concessions was started in the early 1900s by her grandfather who came here from Italy. Cheryl informs me that the Cotton Bowl used to be a roller skate rink and he sold peanuts and popcorn. Later, he invented the Snow Cone Machine to sell at the State Fair. Cheryl’s father is currently the owner of seven concession stands and everyone in Cheryl’s family has worked them including her own kids! After the kids got older Cheryl worked as a Restaurant manager and in Sales before deciding to come full circle back to Medicine. She started off with Family Practice before joining Dermatology Consultants. Cheryl says she loves being able to give the patients a positive experience at the Doctor’s office. Her least favorite part is when the copier breaks or the computer goes down (we can all relate to that!). Fun facts about Cheryl: Her favorite food is Italian particularly lasagna and pizza. Favorite holiday is Thanksgiving because it is the only time of year she can eat all she wants and the whole family gets together without the stress of gift giving. She enjoys traveling with her husband and while she enjoys mountains, she prefers the beach! Cheryl’s favorite skin care product at Dermatology Consultants is Glycolic Acid Wash.
Next time you are in the office please congratulate Cheryl on her one year anniversary!